February flew by for me – it’s been a mix of ramping up in my teaching load and prepping for launching challenges at the beginning of the month, AND getting momentum on getting a shop started. All to say, I’m shocked it’s already days before March. This post will be pretty quick, down and dirty – because I’m ill and want to take a nap! Every month I like to take stock of where I’m at – what worked? What do I need to tweak? I used one of the pages in my weekend spread to look back on what I wanted to keep or change, and sketching out possibilities for March pages. Using Class Pass as a fun way to get my work-outs in each week! I have loved the process of signing up for a variety of fun classes to actually exercise beyond swiping my gym tag time to time. Keeping shared spending tracking on the Mint App – I did NOT miss tracking that! My monthly task overview – I wasn’t quite happy with this yet… but may have found a possible solution! Which brings me to… March! I reference these pages OFTEN – this month I’m looking at the #planwithmechallenge, #rockyourhandwritingchallenge, #brushletterpracticechallenge, and probably a few other lettering challenges. I have such high hopes for this…. The original Bullet Journal monthly log simply has all the dates/days on the left-hand side for you to fill in events or things going on in the month. Kara did a derivative that included a focus on monthly goals and tasks, and I’m taking my twist on it to make it work for me. Expense column – I use Mint, but this will help me see expenses over time. I’ll quickly jot down what I spent/where. Work column – with so many projects it’s nice to see what’s going on across the month. Heavy grading periods, or if I have milestones I need to reach on different projects to maintain momentum, that would go here. I am very hopeful for this layout! Hoping this will help manage overall tasks and momentum. Interchangeable sections – need to segment out some different pieces? I have these categories on the side. 3000 – the class I teach; waiting on – keeping tabs on things floating around in the universe; HH – the student I manage; and PPP – my blog/shop. I originally did the 5-day week layout because I needed more room for weekends! That’s where my chores live, is the weekend. I hate that usually, the weekends are shortchanged on space, or share a box – what’s that about??? So, I dedicate half pages to each weekend day. The opposite side is for a review of my week – what went well? What do I want to change? How did I show up? What lessons did I learn? Taking this time is what makes me and my system better. What are you doing for March? 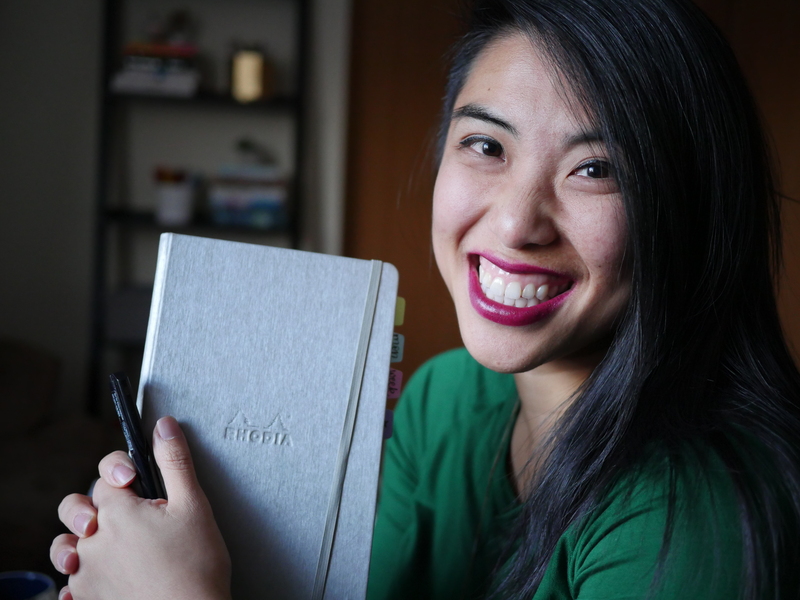 Thank you for sharing your bullet journal journey! I love that you analyze the month and make it better the next. I haven’t started mine yet but have been researching and got some great ideas from this post. Thank you! Can’t wait to see what you create, Liane! I’m yet to try a weekly spread, I generally just do a monthly overview and then dailies. My weeks are fairly regular so I haven’t needed a weekly yet, though I’m sort of itching to try one. This next week I am trying the vertical layout for the work week again … and really short changed Saturday & Sunday. Like your thoughts and month spread evolution. Thanks for the video and the inspiration. Starting my very first journal today. The perfectionist in my is going to use a composition notebook to get started. Not optimal; however, I can’t find a journal I like before the challenge starts on Tuesday. Thanks for sharing your journey here. It’s super helpful to hear that it took you 5-6 months to find the “perfect” weekly set up for you. Let’s me know that there is hope! Also- flexibility is definitely a plus of the bullet journal! This inspired me to reformat my monthly, love your pages. I hope it works and so far LOVE the look and organization of it … I think in the long run it will be more efficient as I felt I was wasting pages and blowing thru my 200 pages BuJo! Need it to last thru end of school if possible – anyway, thanks for this post, really inspired me! I always love the way your weekly layouts look, and I’ve been toying with my own. I haven’t quite found one that works for me, but I can’t let it go! I figure since I visualize my schedule on a weekly basis, my bullet journal should reflect that. Thanks for sharing your beautiful tricks with us!